Located in a former lamp factory in Moscow, Archpole produces chairs, tables and dressers to reach a middle-class clientele. Dozens of small businesses have cropped up in disused Russian factories and workshops over the past few years, creating home-grown designs while turning in a profit. Now the entrepreneurs want more, like restoring manufacturing skills and putting Russia on the map for quality exports. When Konstantin Lagutin and Anna Sazhinova, two young architects, completed their studies in 2008 and began making a modest living doing interior design in Moscow, they soon realized that no one could build them exactly what they wanted. They kept facing the same objections from furniture manufacturers they approached with ideas, who said the ideas were too complicated, or the orders too small or too few to make an effort. So they decided to roll up their sleeves and sawed, drilled and hammered their innovations into reality. It all began for them from some tinkering with a saw and bits of wood in the kitchen. The next realization was that one-off contracts were not going to get them far, and they would have to consider mass production. So they expanded. They now work with a team of 30 people in their own furniture workshop called Archpole. 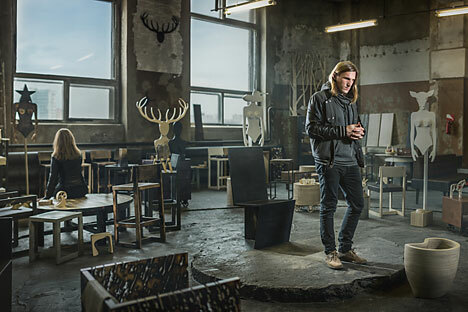 Located in a former lamp factory in Moscow, Archpole produces chairs (sold for about $80), tables, dressers and couches (the most expensive going for $1,300) and targets a middle-class clientele which values the aesthetics and quality of their environs; today an increasing segment of the Russian population, Lagutin notes. Demand rapidly grew when people saw that the company’s products were more than competitive compared to European designer furniture. The two designers do not see themselves as crusaders but rather as part of a new wave of thinking that is gaining traction in Russia, across a spectrum of areas and products. "When I started in 2011, there were perhaps a dozen names that people knew," says Ksenia Nunis, a co-founder of Depstore, a designer goods outlet in Moscow’s fashionable Tsvetnoy Central Market department store. There is a far greater selection today and big chains have also shown interest as they seek to reduce logistical costs, she said. "This is a healthy trend because only those who can handle the pressure of retailers, large sales and manage their own production needs will last in the market. Now is the ideal time to start your own brand," Nunis said. When she started her business as an online shop, one of her aims was to make Russian designers known, while another was to erase the barrier between Western and Russian products. "It was clear that people had reservations about ‘Made in Russia’ products, mainly because of concerns about poor quality," she said. While Russian goods make up around 80 percent of her inventory, Nunis also makes a point to stock well-known foreign brands. Her reason: though retailers recognize the quality of small suppliers’ products, they continue to complain that they are unprofessional in their marketing and often are not even aware of the wholesale prices. Stocking foreign brands is one way in which Russian producers will seriously consider how to offer good quality at reasonable prices, Nunis says. The same cannot be said for the company Fuga-Russia, which combined business acumen with a range of quality oak-made kitchen accessories to secure a place on the shelves of the Globus Gourmet supermarket chain. Co-founder Jana Osmanova had successful earlier careers in investment and PR in Moscow but sought something more. "I was born here, and I am not indifferent to what happens around me," said the entrepreneur. One idea was to revive the tradition of manufacturing that has lain dormant since the Soviet era, while making them profitable, of course. Osmanova began making oak cutting boards in early 2015. Russia is rich in wood and Osmanova knows how to keep a tight rein on spending, so the initial plan seemed sound. "Like many founders of businesses we had the problem that existing manufacturers don’t want to implement our ideas. But nor did we want to resort to some soulless mass production in China," Osmanova said. Like the architects Lagutin and Sazhinova, she and her partners decided to set up their own workshop, and today the Fuga-Russia team consists of 15 people. "It was a conscious decision to produce in Russia, even if it is more difficult," she said. Despite the current recession and people’s reduced spending power, business so far is following her original vision. After half a year on the market, and by selling the cutting boards for $25-35, the company is already turning a profit. While some of the new wave of small manufacturers have some kind of entrepreneurial experience under their belt, more started out from scratch with only a very basic business plan, and in some cases, not even that. Since 2009, Vladimir Grigoriev has run a footwear company called Afour in St. Petersburg. Today it makes 20 pairs of designer shoes and boots as day from three rooms Grigoriev rents in a unused Soviet shoe factory on the edge of the city center. But everything started from a notion to make a few original models for himself. "A friend’s mother worked as a shoe designer and helped me get going," said Grigoriev, whose job as a graphic designer inspired him to offer original, customizable styles and colors. Grigoriev hired a shoemaker to come to his workshop once a week to assemble his own designs for his friends, and then their friends in turn. Social network websites and promotion came next, and then an online store where customers could create their own designs, from burgundy brogues to yellow-black winter boots. "Some of our clients still think we import our shoes from England," laughs Andrei, who manages Afour’s orders. So to avoid any confusion, some styles now bear a tiny Russian flag. "We're proud that we produce locally, but we don’t use this as an additional selling point," he adds. Growth is good so far, with Afour doubling its output each year since it began, but the biggest leap to being a truly Russian business is yet to come. “At some point we will buy all our raw materials in Russia," predicts Andrei. For now, though, almost everything is surplus bought from European manufacturers. The same 100-percent-Russian vision also spurs on the founders of Archpole in Moscow as they now look to expand. The financial year went so well that the two architects bought an old farm in the countryside so they can relocate production from the city and theoretically have room for exponential growth as they launch new furniture ranges. "If we really want to make an impact then we need large-scale production with thousands of employees instead of a few dozen," says Lagutin. Then the trucks that bring all manner of other goods to Russia from abroad can one day be fully loaded with furniture on the drive back.